Lisa has been working on several home projects all summer, although punishing summer heat makes a lot of projects go very slowly, on account of only being able to work for an hour or two in the evenings at best. 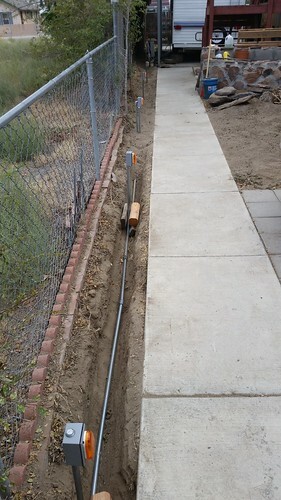 The initial project was to run Ethernet cable through a conduit down to the travel trailer. 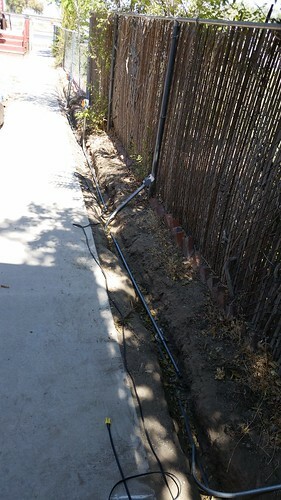 Lisa dug a trench under the house, out to and under the water line (white pipe in this picture) and then under the sidewalk and down to the travel trailer. 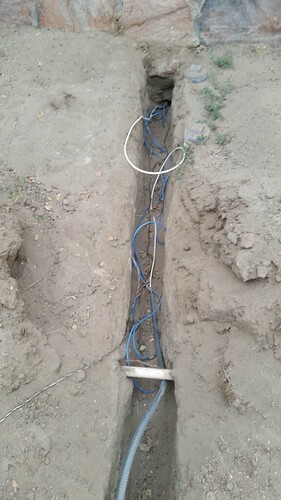 We ran Ethernet through the conduit and then ran the whole thing down to a pedestal next to the trailer, from which she could then patch in the trailer. The initial project works because long ago we bought a small rack panel from Weird Stuff (R.I.P.) 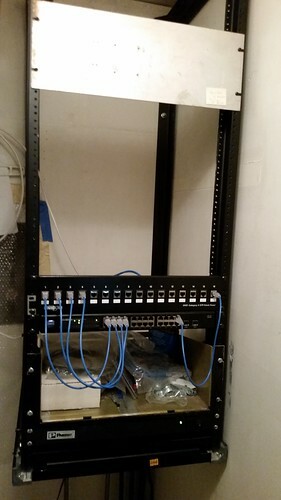 and sufficient patch panels and routers that Lisa installed in a "wiring closet." Currently a line runs from where the telephone comes in to the DSL modem to the router and then back to the living room and the computers there (and now to the travel trailer). Eventually Lisa plans to install a cable modem from the local cable company in the wiring closet, where it will feed the equipment on the rack panel and then spread out to connections throughout the house. 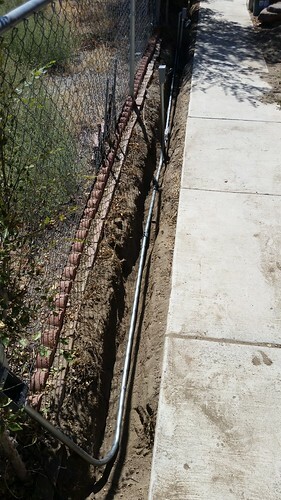 While laying the Ethernet conduit, Lisa got to thinking about what else she could do while she had the trench open. Then she got an idea that made use of material salvaged from Mehama. 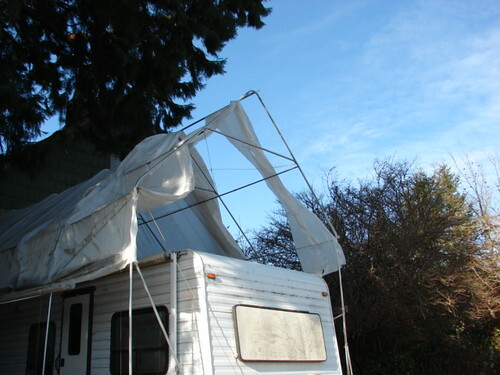 Back when Lisa lived in Mehama, she built a shelter over the travel trailer using metal conduit and plastic. (This photo was taken after a wind storm tore some of the plastic. The metal frame took no harm and we just had to put up new plastic sheets.) Lisa salvaged the entire framework when we left Mehama and carried it to Fernley, where most of it languished in a pile out back. 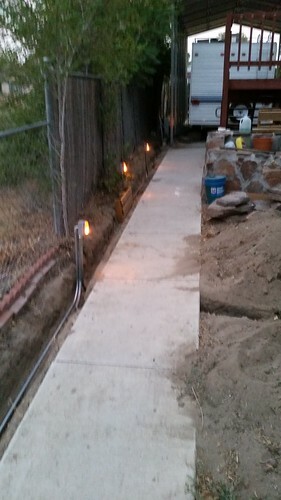 Lisa got her metal-bending tools out and, with the purchase of some additional wire and some wiring boxes, started a project to put lights along the sidewalk that connects the house to the travel trailer. Lisa bent sections of conduit and attached them together, ran low-voltage wire through the conduit, and used auto running lights with one of the two bulbs removed to create each of what was eventually six lights. Here's what it looked like after the first three lights were in place. The light closest to the camera here is where Lisa had to branch off another line away the camera for what eventually were the final two lights. 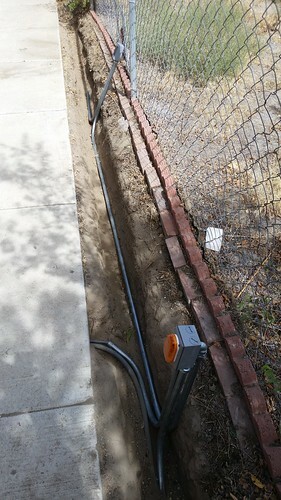 This closer view also shows the flexible conduit running from the house (under the sidewalk to the left) toward the travel trailer. Here's what it looked like after Lisa installed the final station, but before she put in the last light. As the lights were in place, Lisa started filling in the trench. As of this photo, she had filled in the trench under the sidewalk, back to the house, and the southern half (closest to the travel trailer.) Wooden cribbing holds the other fixtures in place temporarily until she was ready to fill that section of the trench. Last night was the first night that all six lights were activated. Lisa has installed a timer back in the wiring closet so the lights turn on and off automatically. 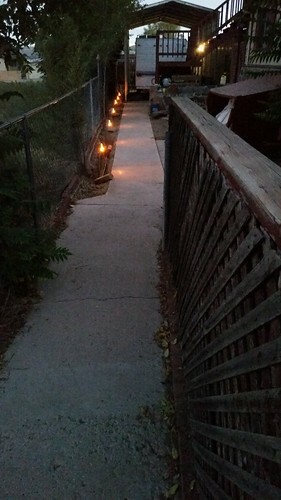 Although the lights do a great job of illuminating the sidewalk, they are hardly visible at all from outside the fence, which suits us just fine. This afternoon after work, I helped dig and move dirt from the original trenching (and from another place on the property where we're excavating for a different project about which more later when it comes to pass) to fill in the rest of the trench. Once we have the trench filled sufficiently, we will cover it with decorative rocks that have been on the property since we got here. I'm pleased with these lights, and with the other work Lisa has done to improve Fernley House.